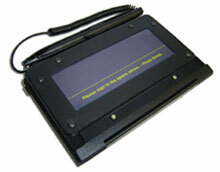 The SigLite Slim 1x5 is Topaz's slim low-cost electronic signature pad. SigLite Slim 1x5 features all the high-quality biometric and forensic capture techniques of a SigLite tablet but with a thin 0.20" profile for extreme portability. The touchpad sensor is equipped with a protective cover when not in use. This device was super easy to use and worked out of the box with the MS office and Adobe products with the free plugins they provide. Painless to set-up and record signatures.